As runners, we spend most of our spare time running, so fitting in strength training, yoga, and general recovery can be a challenge. In an effort to make strength training more convenient, I decided to get a kettlebell. Little did I know I was purchasing my own piece of history! Did you know that iron kettlebells were first introduced in the 1700s? Initially, the kettlebell was used to weigh crops, but eventually turned into a prop used by strongmen to demonstrate their extraordinary strength. Since then, the kettlebell has established itself as one of the foundational pieces of equipment in gyms across the world. From strength, balance, flexibility and endurance, the kettlebell is one of my favourite pieces of training equipment. “Come to a treadmill class with me!” she said. I’m a runner, and I have been for more than half my life. I’ve run on teams, I’ve run on trails, on tracks, with training groups. I’ve gone to spin class and Zumba and cardio kickboxing, so I’m also no rookie to fitness classes. But “treadmill” and “class” together? That was new. 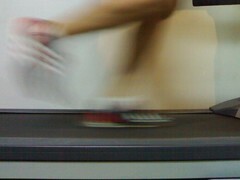 I don’t hate on treadmills as much as some runners do. I’m thankful for it as a tool to have when it’s too hot, too windy, too icy, or too freaking cold to make the effort to get outside. Yet I was still skeptical of what could possibly be the point of going to a treadmill class. What could the instructor possibly say? “Run faster!“? I have that on repeat in my head on my own, thanks. Hi! It’s Salty here. Before we get to Cilantro’s post, I wanted to let you know about this awesome new winter feature. We know many of you turn to the treadmill when the roads get slick, the night comes early (and seemingly never leaves), you have rug rats napping during your run time or because you’re just as pressed for time as always. To make those ‘mill runs more tready and less dready, we’re going to bring you tips each week. We’ll bring you specific workouts to do, etiquette tips for gym treadmills, entertainment suggestions and more! If you have any questions or treadmill topic ideas, send them here! You’re going to make it through this winter in shape, after all! As the temperature drops… and drops… my motivation and ability to run outside follows suit. And when the snow started falling on Saturday and the high temperature hit 23 degrees, I realized that I was going to have to take my training inside for the next five months. I’m training for my first 50-miler in March and then what will hopefully turn into my first BQ marathon in May so this means that I’m going to be logging many miles inside my university fitness center.